L–R: Christopher Cushing, USAID Director; Saboto Caesar, St Vincent and the Grenadines’ Minister of Agriculture, Industry, Forestry, Fisheries, and Rural Transformation; Roland Bhola, Grenada’s Minister for Agriculture, Lands, Forestry and Fisheries, and the Environment; and US Ambassador to Barbados, the Eastern Caribbean, and the OECS, Larry Palmer. 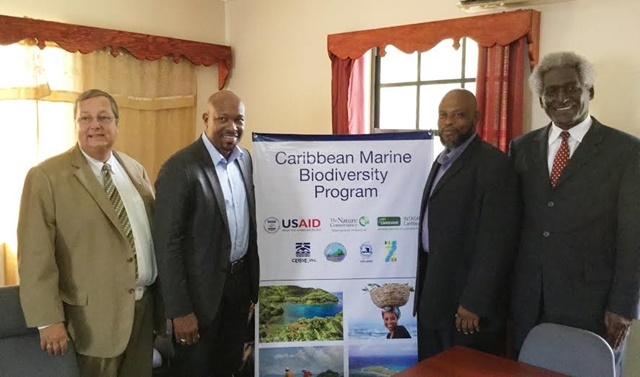 In an effort to protect critical marine ecosystems and reduce threats to the region’s fisheries and tourism sectors, the United States Agency for International Development (USAID) has launched a US$12.5 million Caribbean Marine Biodiversity Program (CMBP), to promote conservation in high priority areas across the Caribbean. The five-year initiative seeks to improve the management of marine protected areas (MPAs); reduce threats to the environment including coral reefs, mangroves, and sea grass beds; strengthen fisheries management, and promote sustainable livelihoods for coastal residents in four seascapes across five countries. Against the backdrop of the picturesque Grenadine island of Carriacou, United States Ambassador to Barbados, the Eastern Caribbean, and the Organization of Eastern Caribbean States Larry Palmer, on August 21, officially launched the Grenadine Bank component of the CMBP. He told his audience, which included government Ministers, environmentalists, and other key stakeholders, that while the Caribbean region had been described as one of the world’s most important biodiversity centers, the region’s biodiversity was being degraded “at an alarming rate,” with coral reef coverage reduced by nearly one-third since the 1980s. “Several reef-building species are acutely endangered or at risk of extinction. These changes have had an increasingly negative impact on the ability of the reefs to remain healthy such as spawning grounds and natural barriers that protect against storm surges and sea level rise. Economic sectors like tourism and fisheries, which depend heavily upon the quality of the marine environment, are particularly affected,” noted Ambassador Palmer. The CMBP is primarily funded through a USD$10 million investment by USAID, with an additional US$2.5 million contribution by The Nature Conservancy (TNC), which leads an NGO consortium charged with its implementation. NGO partners will implement various activities at the local and regional levels, with CARIBSAVE, and Sustainable Grenadines working in the Grenadine Bank. Addressing the launch, St. Vincent and the Grenadines’ Minister of Fisheries, Saboto Caesar, said the initiative sought to ensure that “Mother Nature is protected and that generations to come can enjoy some of the resources that we enjoy today. In St. Vincent and the Grenadines we are moving towards private/public sector joint venture enterprises to ensure that we further explore our marine resources. But in our quest to develop as small multi-island states, we have to ensure that we do not take the word exploitation to illogical conclusions, it is very easy to do so.” he cautioned. Describing Carriacou as “one of the few remaining unspoilt spots in the region,” Grenada’s Fisheries and Environment Minister, Roland Bhola, lamented that through our everyday activities as humans, we were “rapidly destroying ” our natural environment. “I want from the outset to commend and thank USAID, TNC, and all the other partners that saw it necessary to first and foremost provide the funding, and secondly to provide the persons who have the ability, the knowledge, the skills, and the experience to work with us, and to assist us in protecting what nature has provided for us,” he said. Providing an overview of the multi-country project, Shelden Cohen, the CMBP’s Chief of Party, said its focus was on promoting healthy marine environments and the associated tangible benefits for fishers and community members. “Human benefits are really at the heart of this program, and I can’t emphasize that enough,” he stressed. Cohen further noted that the CMBP supported effective governance of marine resources in order to foster long-term conservation of marine life and biodiversity; maintain economic benefits derived from a healthy marine environment; and to improve the well-being of local communities adjacent to targeted marine sites. The launch allowed stakeholders, including youth participants, to discuss priorities and determine strategies for moving forward.